Provide snow fighter supervisors with up-to-date information, allowing them to spend more time in the field to assist and communicate with the snow fighter crew. This will lead to improved resource allocation, enhanced efficiency, and superior responsiveness of snow removal equipment and crews, thus lowering winter operational costs. AHMCT researchers are developing a cost-effective mobile information system for snow fighter supervisors to provide in-vehicle access to critical information needed to make timely decisions. The system simultaneously increases supervisor situational awareness and enables them to stay in the field longer to assist and communicate with snow fighter crews. With increasingly constrained state budgets, Caltrans winter maintenance and snow removal operations must do more with less. Snow fighter supervisors are crucial in this effort. Ideally, supervisors are in two places at the same time–the office and the field. In the office they have access to rapidly changing weather forecasts and radar, traffic conditions, satellite images, phones, and, in some cases, Road Weather Information System (RWIS) terminals. In the field, supervisors are often needed during a snowstorm to assist other snow fighter team members. The supervisor’s physical presence in the field enables direct observation of fast-changing road and weather conditions which facilitates decision making. 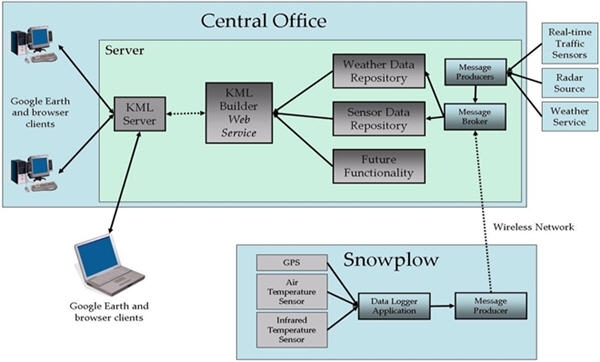 The goal of this research project is to provide snow fighter supervisors in the field with the abundance of information previously available only in the office. Around-the-clock access to this crucial information and the supervisor’s ability to stay in the field longer can improve resource allocation decisions, enhance efficiency, increase safety, minimize environmental impact, and enhance the Caltrans work environment. This improves the responsiveness of snow removal equipment and crews, thus lowering winter operational costs, and helps keep the road open. A mobile information system for snow fighter supervisors is an essential part of an effective Maintenance Decision Support System (MDSS). AHMCT researchers are developing a mobile information system for winter maintenance supervisors and staff. The system integrates perpetually changing information essential to the supervisor’s decision-making and provides around-the-clock in-vehicle access. The best information is worthless if it can’t be delivered. The system seeks to maximize communication options at the lowest cost by using 802.11 wireless, 4.9 GHz wireless, and cellular data. The flexible system design can incorporate future wireless connectivity such as WiMAX. The system can provide previously unavailable information from vehicle-based sensors, in particular temperature sensors providing ambient and road temperatures. 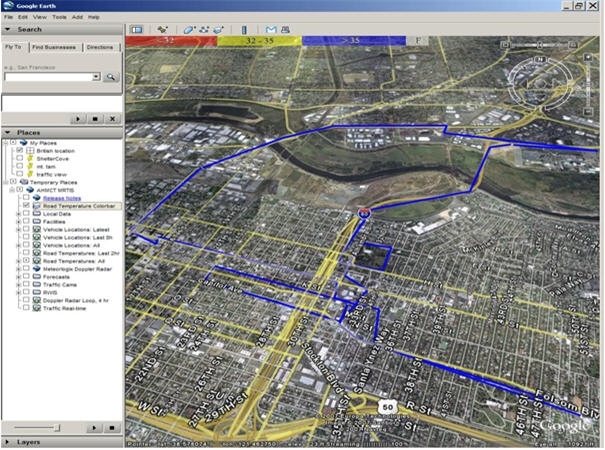 GPS is used to provide vehicle location and speed. For effective decision making, the system integrates and presents information from multiple sources: weather forecasts, real-time and historic radar images, real-time traffic camera images, in-vehicle sensor data, and real-time traffic. These data sources are integrated in a single user interface client, which includes a terrain model. Because humans interpret pictorial information more efficiently than text, pictorial information presentation is used as much as possible. 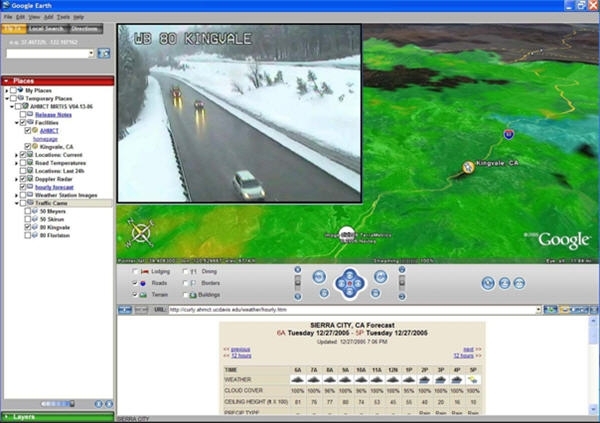 The system also includes prototype Road Weather Information System (RWIS) data. RWIS environmental sensors provide real-time temperature, wind direction, speed, humidity, and precipitation data. Integration of RWIS with other data sources has been shown to cut costs through accident reductions, lowered insurance premiums, improved snow removal efforts, and reduced traffic congestion. Further work in this area is anticipated to greatly expand the scope of RWIS data integration. An important aspect of AHMCT’s mobile information system is the standardized interface and client, and tiered server architecture. The secure system is only available to authorized users. Caltrans vehicles operate in a challenging communications environment–wireless networks have discontinuous coverage and in mountainous areas have limited range. Integrating a commercial mobile wireless router into the vehicle solves many of these problems and provides a transparent IP connection as the vehicle moves between various wireless networks (802.11, 802.11p, cellular, future wireless). Relevant system data such as radar images are cached locally and updated after a lost connection is reestablished. 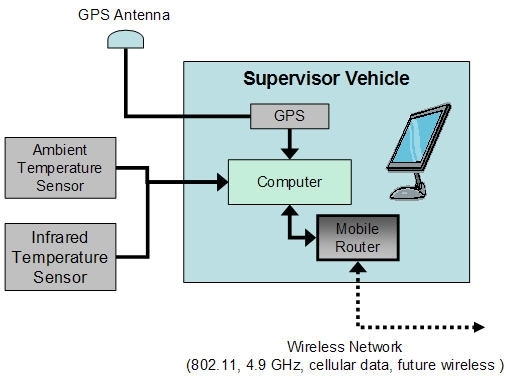 Vehicles wirelessly connected to the network provide a new conceptual basis for Maintenance Decision Support–connected vehicles become additional roving network nodes that can provide real-time data to the network. The current AHMCT mobile information system integrates GPS, ambient temperature, and road temperature sensors. Historic and real-time temperatures, vehicle locations, speeds, and paths are available and integrated with the system. Future sensors could include video, additional weather functions, etc. Researchers have completed development and testing. Final project testing and demonstration to DRI and Caltrans Maintenance is anticipated in mid 2007, with further data collection along Interstate 80 between Kingvale and Donner Summit. Project results indicate that providing an integrated in-vehicle information system enhances the effectiveness and efficiency of winter maintenance operations. Based on the state-of-the-art and the trends in wireless communication, combining in-vehicle information systems and Maintenance Decision Support is both feasible and cost-effective, and commercial prospects are promising.